Number of Members: Estimated over 750,000 larger than 1 km. Number of confirmed objects varies according to source. At the end of the 18th century, a hypothetical law called the Titius-Bode Law was generally accepted among astronomers. This law supposedly governed the orbital spacing of planets, and was bolstered by the discovery of Uranus, which fit the prediction for a planet orbiting beyond Saturn. The law also predicted that a yet-undiscovered planet should exist between Mars and Jupiter. As a result, a group of 24 astronomers began a systematic search for such a planet. However, it was not until 1801 when an object was actually discovered at the proper distance, and by an astronomer who was not a member of this group. This object was at first classified as a planet and given the name Ceres. In the next few years, though, three more asteroids—Pallas, Juno and Vesta—were found. After a few “dry decades” more asteroids began to be discovered, and astronomers realized that these were all members of an entire group of objects. Ceres was demoted from being a planet, and the asteroid belt was formally recognized. Today, the number of asteroids larger than 100 meters across is estimated to be in the neighborhood of 25 million. Most are merely irregular chunks of rock, although Ceres is almost spherical, and the next largest three—Vesta, Pallas and Hygiea—resemble rounded ellipsoids. Asteroids vary wildly in their makeup. Ceres, the largest, essentially has a structure similar to icy moons in the outer Solar system; that is, a rocky core surrounded by an icy mantle and crust, with a possible subsurface ocean. By comparison, another large asteroid, Vesta, is rocky, and appears to have a nickel-iron core. And Hygiea, nearly as large as Vesta, appears to be completely undifferentiated. S-type, or silicate asteroids, which are mostly found in the inner part of the main asteroid belt. They are moderately bright and consist mainly of iron- and magnesium silicates. The largest example of this type is Eunomia, which is about 330 kilometers across in its widest dimension. M-type, or metallic asteroids, which are found near the middle of the belt. Also moderately bright, they are composed primarily of nickel-iron, occasionally mixed with small amounts of stone. They are believed to be remnants of the cores of differentiated asteroids—or possibly planetismals—that were shattered in collisions. The largest member of this type is Psyche, with a maximum diameter of around 240 kilometers. C-type, or carbonaceous asteroids. These are the most common type of asteroid, making up around 75% of the total population, and dominate the outer portion of the main belt. They are relatively dark, and are composed of a mixture of materials, including silicates, oxides and sulfides. Their chemical composition is similar in percentages to the Sun. The largest asteroid that is clearly a member of this type is Hygiea, at around 530 kilometers in its largest dimension. However, some astronomers classify Ceres as a member of this type, so it depends on which classification scheme you choose as to which is really the largest member. In addition to these basic composition types, water ice has been detected on a few asteroids, and is believed to be quite common, especially in the outer part of the belt where temperatures are lower. Interestingly, organic compounds such as amino acids have been found on asteroids. Recent studies of asteroid rotational rates, combined with models involving collisions, imply that the majority of asteroids with diameters greater than 100 meters are most likely “rubble piles”, that is, aggregations of smaller rocks loosely held together by gravity. A number of asteroids have been found to have smaller asteroids orbiting them like moons. Theories suggest that both asteroid moons and rubble piles may be the result of ancient collisions. Asteroids can be broken down into three main classes: those in tne asteroid belt, near-Earth asteroids and Trojan asteroids. These classes are based upon their orbits. The vast majority of asteroids are considered to be part of the asteroid belt, which is confined between Mars and Jupiter. They have low-eccentricity orbits and tend to lie closer to Mars than to Jupiter. This is probably because the gravity of Jupiter would tend to disrupt the orbits of asteroids close to the giant planet. As a result, the great majority ended up closer to Mars. The largest asteroids—Ceres, Vesta, Pallas, Hygeia, etc.—are all found in the belt. Asteroids that cross Earth's orbit or pass near Earth are classified as near-Earth asteroids. In fact, typical meteors are merely small near-Earth asteroids that happen to hit the planet. (There are also meteors that are of cometary origin.) Small asteroids—also called meteoroids—do not present a hazard to Earth, since they either burn up in the atmosphere, or else simply land somewhere, usually without causing damage. Due to the size distribution of asteroids, the chances of impact diminish as diameter increases, which is fortunate, since if an asteroid merely a hundred meters in diameter were to hit Earth, the effect would be as devastating as that of a large nuclear weapon, only without the radioactivity. In 1908 an explosion estimated at 10 megatons occurred in Siberia, probably caused by an asteroid considerably less than a hundred meters in diameter disintegrating and exploding in the lower atmosphere. In 1994 a comet fragment only two kilometers in diameter blew a hole through Jupiter's cloud deck that was as big across as the entire Earth. A “Trojan” asteroid is one that orbits either 60° ahead or 60° behind a planet. These are points that are gravitationally stable; if perturbed, an object will tend to return to that point, rather than drift away. At the time of this article, 5 planets are known to have Trojan asteroids. Jupiter has by far the largest number of Trojan asteroids. This is no surprise, given its size and gravity; Jupiter probably captured a large number of former belt asteroids and shifted them into Trojan positions. In fact, they are so numerous that the two different groups actually have different names: The group that trails Jupiter is known as the Trojans, while the ones that lead are known as the Greeks. This nomenclature, of course, comes from the history of the Trojan War. In addition to the Jovian Trojans, Neptune is known to have 9, Mars has 3 known Trojans, and Earth and Uranus each have one known Trojan. There is no current reason to believe that our Solar System is unique in the universe in possessing asteroids. In fact, at the time of this article, at least one extrasolar asteroid has been confirmed to exist, orbiting a white dwarf star. The most interesting aspect of this alien asteroid is that astronomers have confirmed that it has water ice on its surface. Asteroids were unknown to the ancients. 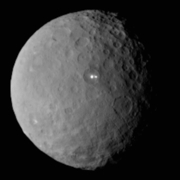 Ceres, the first discovered, can only be seen through a telescope, as with all the others. Nevertheless, the asteroid belt is not without effect on our skies. Zodiacal light—a faint, trinagular patch of luminescence extending upward from the Sun just after sunset and just before sunrise—is caused by reflection of sunlight from cosmic dust in the solar system, and one of the primary sources of this dust is believed to be collisions between asteroids. Today, many scientists are concerned about the possibility of an asteroid striking Earth and causing massive amounts of damage (see the section on Disasters in What the Future Holds). The 15 meter rock that exploded over Chelyabinsk, Russia, in 2013 sent nearly fifteen hundred people to the hospital and shattered windows throughout the city. And this was a relatively small one; the one that hit Siberia in 1908 was estimated to have been at least 4 times larger in diameter. Therefore, a lot of effort is being made to detect near-Earth asteroids, in the hope that, if one should be clearly shown to be on a collision course, something could be done to deflect it. So far, no space rocks have been confirmed to be on a course to hit our planet, which is fortunate, because at this point in time, we do not have any technology guaranteed to be able to change the course of an asteroid—or the debris from its destruction—in order to prevent an impact. Early in space exploration history, the asteroid belt was perceived as a place of rocks and shoals, where spacecraft would be hard put to pass through without suffering collisions and being damaged or destroyed. However, in 1972 Pioneer 10 entered the belt and passed through without incident. Since then, a number of probes have successfully traversed the belt and there has yet to be a collision. Most of these craft were merely passing through on their way to the outer solar system, but there have been a few sent out specifically to study asteroids. And even some of those on their way to places like Jupiter and Saturn sometimes flew past particular asteroids and took data. Galileo imaged Gaspra and Ida on its way to Jupiter. Similarly, Cassini flew past Masursky on its way to Saturn. NEAR and Japan's Hayabusa both studied near-Earth asteroids, orbiting them and—in the case of Hayabusa—even landing on one. In September of 2007, the Dawn probe was launched and sent on its way to the asteroid belt. It was the first space probe to use an ion propulsion system, which although the amount of thrust generated is relatively small, is highly efficient. In July of 2011, Dawn entered orbit around the asteroid Vesta, where it stayed for more than a year, departing Vesta orbit in September of 2012. 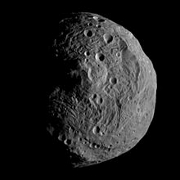 During its time at Vesta, Dawn mapped its surface and examined its composition. The entire south polar region is one huge crater. It is believed that the impact which created this crater probably ejected what are now referred to as the V-type asteroids and HED meteorites. In addition, Dawn also observed a series of equatorial troughs that probably resulted from the impact. These are just a few of the discoveries made by Dawn. For more information, there are many good sites, some of which are listed in the column on the left. In March of 2015, Dawn entered orbit around Ceres. After an initial high-altitude mapping orbit, it then proceeded to descend to lower orbits, where it obtained higher resolution images and more data about this small world. The enigmatic bright spot first resolved into two spots, and as Dawn grew closer, into two clusters of even smaller spots. In late 2015, NASA scientists reported that the bright spots may be composed of some type of salt, brought to the surface in the form of brine, which then evaporated, leaving behind the salt. In addition to the bright spots, Dawn also spotted a highly reflective pyramidal mountain, which is believed to be a type of volcano which erupts a kind of “salty mud”. There are still many mysteries to be solved about this unusual world. Hopefully, someday another spacecraft will be sent out to explore Ceres. But for now, we must be content with the data sent back by Dawn. Because of their small size and low gravity, asteroids have often been considered prime candidates for eventual mining and colonization. M-type asteroids are rich in minerals and ores useful in an industrial society. Carbonaceous asteroids probably contain all the elements necessary to support life; it would merely require the appropriate technology to mine them and convert them into water (probably already present in many asteroids), oxygen, nitrogen, etc.